I am heavily invested in the Apple Ecosystem going back to 2005 with the purchase of a 5th generation iPod(still have it) and a second generation iPod Mini for the wife that same year. Anything I have ever purchased Apple I still have somewhere. The old tech from 10+ years ago might be slow and low on memory today but they still do a decent job including a 2007 MacBook Pro that refuses to die. You pay more for Apple but if you take care of something that is built with quality, it will last well beyond your expectations. 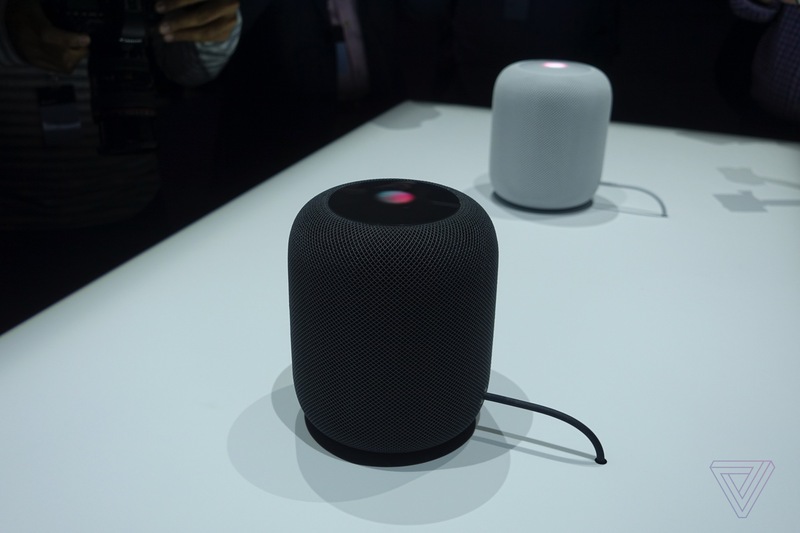 Apple finally entered the smart speaker business in February of this year with the long awaited release of the HomePod. Years in the making and about 3 months behind its original scheduled release date the speaker utilizes seven tweeters in its base and a four-inch woofer towards the top, as well as six microphones used for voice control and acoustic optimization. The device runs an iOS variation known as "audioOS" and features an Apple A8 system-on-chip. You can tell it to make and manage a call, read/compose/send texts, control smart home features like lights and thermostats, play podcasts and apple music on voice commands, etc.... Unless you subscribe to Apple Music, this device is not for you in my opinion. The original price tag is very Apple, holding at $350 until the recent holiday sale. I am a loyal SONOS guy when it comes to wireless speakers. I find it impossible to beat the SONOS Play 5 second generation when it comes to sound performance. Getting a HomePod when it was released didn't make sense for me since it could not be shared within my SONOS network.....that was until the release of Airplay 2 back in May. Now from the Apple sound menu, I can now pair HomePod with at least 3 of my SONOS speakers that have "smart" capabilities which is a big benefit. The sound quality is exceptional, clearly beating all of my SONOS Play 1, SONOS ONE and Beam speakers. Only issue with HomePod is volume control. Volume is very limited compared to SONOS. Thats intentional for sound quality but still irks me since SONOS will play extremely loud with little to no distortion. I only use the HomePod in my office, mainly for calls, podcasts and music. With the recent price drop I went and got a second speaker for the office to create a stereo setup. I have read and watched probably a dozen reviews on the stereo pairing quality of the two units, which clearly eliminates the volume limitation I found with one unit. I paired them yesterday for the first time as a Left and Right Channel speaker and have now found something that beats the SONOS Play 5. Definitely a game changer as far as bass and sound. Haven't tested it yet with the TV so I will figure that out closer to the holidays. Definitely NOT worth the investment at full price but if you get a pair with the current sale of $100 off per speaker it puts them at the exact same price point as the SONOS Play 5 but it allows you all of the smart speaker benefits that isn't currently available with the Play 5. I have a love/hate relationship with Apple. As a consumer, I generally like their products. I deal with open source Linux stuff all day, and you're pretty much flying blind / working without a net in that environment. Nothing you find on Google is 100% accurate. No one will help you figure things out, etc. To a lesser extent, I use Windows / Android, where everything is a bit easier and better-documented, but also kind of disorganized and inconsistent. Apple gives a much more seamless user experience. The uncertainty and frustration is minimized compared to other environments / manufacturers. That said, when I'm making a website or application, dealing with Apple can be a real headache. The tradeoff to all that consistency and predictability is that developers are held to very high standards and are expected to invest a lot more time and money into their finished product. I do wish we could find a happy medium in some form. Yep.....saw it when we released our first mobile app on Google Play and The App Store. Not to say that crap doesn't land in the app store but you could see the difference with the requirements and process when submitting/launching iOS apps. As a consumer, I didn't own an iPhone until the end of 2016 even though they hit the market back in 2007. It wasn't business friendly and it wasn't as open for customization compared to Android. I like to take care of anything I own so I always put a screen protector and case on my devices. Usually after two years with Android, I could seriously see how it slowed down, battery life was probably around 60% of original life, updates were fairly worthless, etc.... I am just north of two years with my iPhone and it hasn't skipped a beat. Even the battery health is holding at 85%. I don't see buying another phone for at least another two years at this point where I would easily be looking every two years if I was still rolling with a Samsung.